this is what you see when you die. Yes, you're dead! Well, how did you think God looks like? THIS ACID IS REALLY KICKING IN, MAN! I can explain this... 42. 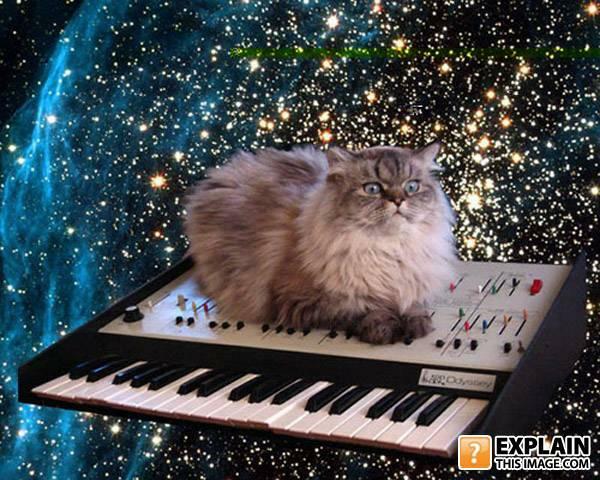 Space Kitty says, "One More Time, with feeling"
I'm in ur outer space, stealin ur musix. WHO THE F U C K DIVIDED BY ZERO!!!!!! I m n ur galaxy, makin ur trance. now all you need are rainbows and a poptart! cat goes "wait...something is wrong here.. o.o"
"You have given me the fish, now I shall grant you whatever is in my power to bestow. What is your wish?" Nyan cat creates his music. DAMN IT !!!! WOMAN, call the fire service!!! The freakin' cat is stuck in outer space again!! Jamirocat "canned tuna in my heels tonight"
Keyboard cat plays magical tunes everywhere! INCLUDING SPACE! The fate of Adolf Hitler's cat and Herbie Hancock's keyboard was left up to the international courts. The great Cat-tor and his magical synthesizer go on a never ending quest to spread electronic music throught out the entire universe. Little did Phil Collins know, Earth's yellow sun would take all his hair and hideously deform him. The cat is recording the noises in space to add into it's remix. If anybody's been to YTMND, this is what you see before you die. Duh. via my niece, Emily: "Its like jesus just took a crap on outer space and this is what came out of it." words can't express the awesome! Music cat, send it to the moon! its like jesus just took a crap on outer space and this is what came out of it. That cat is trippin' ballz, man. MUSICAL "SSPPAAAACCCEEE PPPUUUUSSSSSSSSSYYY" TO THE RESCUE !!!!! This is the face of God. Surprised? You just got Kitteh Roll'd! That's what happens when you do acid on eastern europe. haha. that cat has got CRAZY EYES! Holy hell, how much crack DID i do? Cat saw Hitchhickers Guide thru the Galaxy and now thinks he's the new Dr. Spock!!! Finally, "Starship" was reduced to just one member. The keyboard player. And he was a cat. Oddly enough, his first album went triple catinum. and thus, space kitteh successfully divided by zero. someone got happy with photo shop. c'est fatou entrain de mouler dans l'espace !!!!!!!!!!!!!!!!!!!!!!!!!!!!! Nyan cat is an impostor, I'm the real one. Get your tickets now for the Keyboard Cat World Tour! Welcome to the Internet. I will be your guide. That's an ARP Odyssey, one of the greatest analog synths ever. Also, there's a cat on it. Keyboard cat and ceiling cat had a baby! This is what cats hell looks like. A man walks into a bar and sits down. The bartender then lights him on fire.